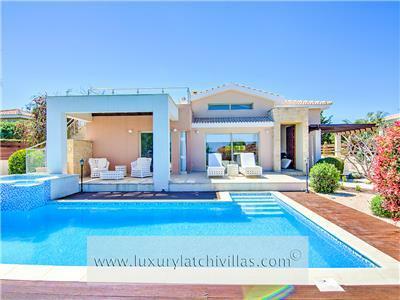 "Gorgeous villa in a great location. Walkable distance to the beach, harbor, supermarket and polis town with lots of restaurants. Villa is really peaceful and comfortable. The beds are comfy including a range of nice pillows. Loads of wardrobe space and 3 nice bathrooms. The owners leave lots of useful information and make it very easy. We went in November and although the weather is still lovely it’s definitely too cold to enjoy a dip in the pool." "Villa Zephyros is fabulous! This is a stylish and thoughtfully designed property with amazing features. It is a very comfortable space and totally relaxing. We were delighted to have been able to find it. However the location is very secluded and tucked away from amenities. The nearest substantial town is around 30 minutes away by car and there is nothing of interest locally and certainly nothing within walking distance. The villa is perfect if you want to relax in total privacy, undisturbed, and unwind and chill. The only disadvantage is the location. The nearest restaurant is located in the city center. You will definitely need a car to access this villa. But once inside, you do not want to leave. It is so peaceful and has amazing natural light throughout. A very rewarding stay. Thanks."